The mercury is rising here in rural Hungary and as a result of that food needs to be quick and simple, but still tasty of course. This really zingy garlic lemon chicken is just the key. I sometimes despair at some of the garlic lemon chicken recipes I see for the lack of both garlic and lemon. This recipe packs a real punch though and searing the lemon really adds a depth to the flavour, you could of course add a little honey to cut the sharpness if you wished. Spending just 10 minutes in the kitchen preparing this tasty dish is all it takes until you head back and get it out of the oven, which leave plenty of time to hide in a shady part of the garden with an ice cold beer trying to hide from temperatures of 40°c+. I typically think of one pot wonders as being hearty winter dishes but the massive zing of freshness from the seared lemons gives this dish a wonderful freshness and makes this zingy garlic lemon chicken a stalwart in the Krumpli household on the blisteringly hot summers days. It is hard to believe that just a week ago we were off gardening duty due to unseasonably cold and wet weather and this week even the locals are struggling with the heat. Unfortunately our vegetable plot still needs tending and we have to get up at stupid o’ clock in the morning to make watering them worthwhile, so I am feeling a particularly tired and grump farmer at the moment. However on the plus side we are heading out to see one of my favourite bands this weekend which will no doubt lead to lashings of beer and naughty Hungarian fast food, in fact why not follow me on Instagram and catch up with the pictures I will no doubt post whilst your garlic lemon chicken is roasting away in the oven. 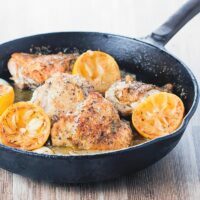 The very essence of simplicity packed with zing and this garlic lemon chicken recipe can be on our plate in 40 minutes & 30 of that is all about relaxing! Pre heat your oven to 180°C-350°F. I use a meat thermometer to check when meat is cooked to perfection, for chicken I place my probe into the fattest part of the chicken and look for an internal temperature of 73°C. Wonderful photos! Looks like such an easy dinner recipe! Thanks Amanda, you are right, insanely simple and really tasty! This chicken dish sounds divinely delicious. 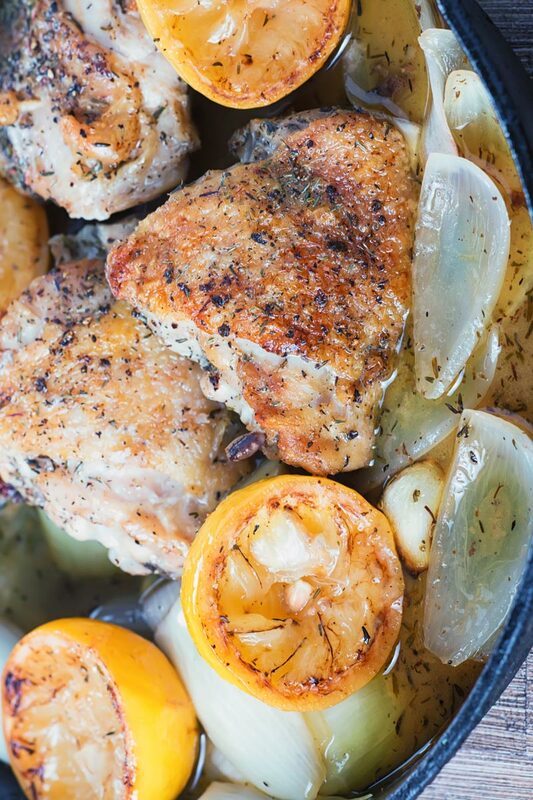 I love the combo of lemon and garlic and the fact that it can all be done in one pot! Fab! Lemon, garlic and chicken and I’m a happy bunny! This chicken dish looks and sounds amazing! I love the combination of lemon and garlic. I will be trying this recipe. 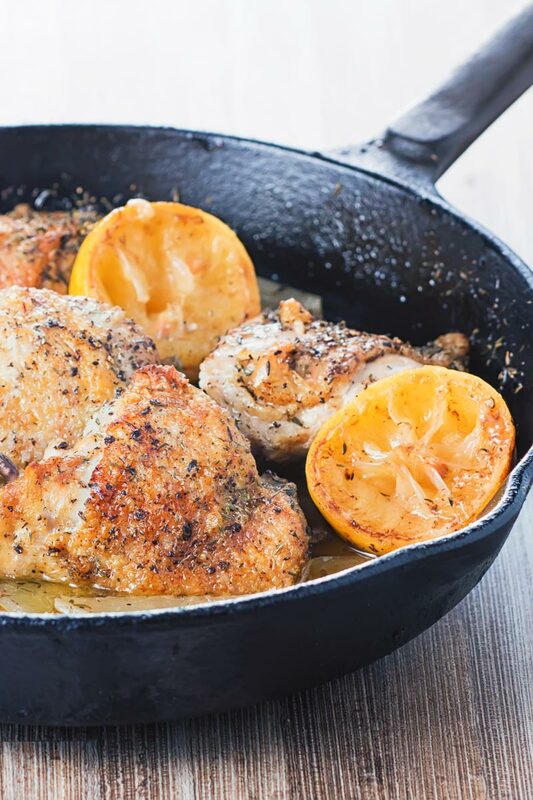 I found your recipe for Zingy Garlic Lemon Chicken, yesterday from a site that was touting cast iron pans. It had you website written at the bottom of the page. I had all the ingredients on hand so this evening I decided to fix it. My first question has to do with the onion in item #4. It is not listed in the ingredients. Is it to be quartered, sliced, chopped or minced? I chose to slice them thinly. My next question has to do with the 6 cloves of garlic. Is it to be sliced, squeezed, chopped or minced? I did minced. Next question has to do with terms. You said to sear the lemons to singe. I cut the lemons in half and put them cut side down in the hot skillet. Was I correct to do it that way? I did a search and could find nothing on the web that talked about searing the lemons to singe. Also, being from the States, the 180 degrees threw me. Then I saw the 65-70 degree Celsius below and I realized the 180 was really 350 degrees F. Sometimes it takes me a minute to wake up. Plus, I saw the UK on the end of your website. I went ahead and fixed the chicken, doing what I thought might be correct and it was very good. I will be fixing it again, hopefully with your added information. I’ll go through your points one by one and hopefully improve on something you liked. 1: I cut the onion into 8 wedges (Updated in the recipe)… I do this as I like the onion to maintain a little shaped and texture but sliced thinly will work. 2: This is one of those Whole Garlic clove dishes, I have confirmed it in the recipe, you can either peel the garlic or leave it in the paper like skin. In the cooking time this garlic will become very soft and mellow, if cooked in the skin it will need squeezing out as I find the paper like skin unpleasant to eat. 3: I guess this is a case of two nations separated by the same language, in all fairness the UK is separated by the same language too… Singing something is a high fast burn so you end up with little caramalised sections. Sounds like you got it spot on. 4: I’m working on a conversion plugin at the moment and have largely settled on using the °C to denote Centigrade, not sure how I missed this when I went back and to clarify my early recipes. I am really struggling getting my conversions to work with Cups but may abandon that notion and just run it with temperatures and weights. I hope you enjoy the recipe and thank you very much once again for taking the time to give me some pointers. Simple recipes are just the best! This one look awesome Brian!! I sometimes feel like a fraud posting a simple recipe so getting comments make me feel less so, thank you! Simple yet sooo delicious. Love this! Thanks Tracy, it really is so simple it hurts and it tastes fabulous! I love chicken and your recipes are always amazing. Can’t wait to try this. 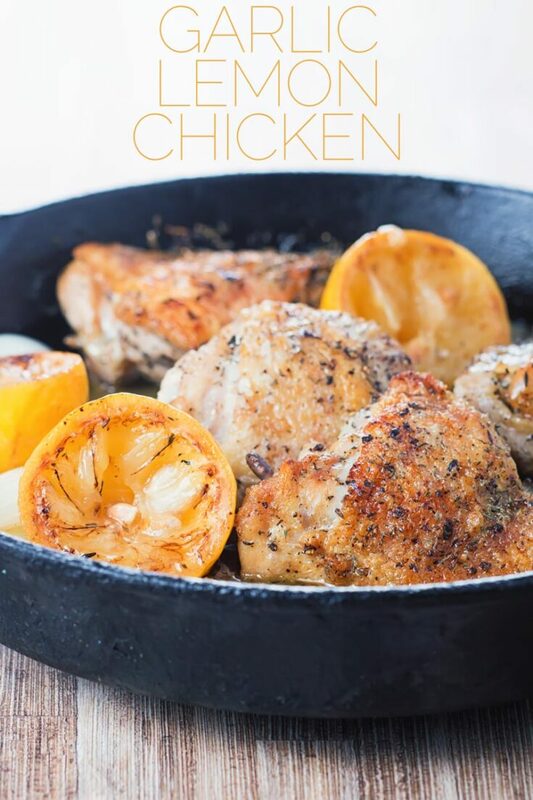 I love lemon, garlic and thyme and this chicken looks just perfect! Seems pretty easy too 🙂 Delish!! Me too Whitney, this is one of those summer dishes where you can have to oven on and avoid the kitchen, so simple it hurts. Did I mention that my cast iron skillet is my favorite cooking vessel??? Amazing! I’m loving all of your recipes and I’ve been making a list of the ones I want to try, and this chicken is one of them! Delicious looking chicken! I’ll definitely enjoy giving this recipe a try! We’re still enjoying sunny summer days, so this will be perfect!! Wowwwwww! Looks quite easy to make and appetizing. I love the combination of lemon and chicken. Wow, my favorite flavors, and it looks amazing!! Awesome photos! I love the look of this garlic chicken and the sound of the recipe. Great combo of flavors! Lemon and chicken – 2 flavors that I love together. Looks delicious and I can’t wait to try it. I found this simple. And it looks so fetching. I love how easy this looks – can’t wait to try it! That chicken looks delicious! Love the zingy lemon in this.